What do you do with your leftovers? Do you ever turn them in to a new fresh meal? I have to admit – I am not good with leftovers. I hate dealing with them. I will try and pawn them off on anyone else in the household to send for lunch. Otherwise, they just sit and fester in the back of the fridge and then I toss them all come Friday morning. I hate wasting. I really do, but it gets to a point that I can’t stand to look at the same meal twice, or at least multiple days in a row. One thing that does get used up is pasta. There is always something that can be done with pasta. When I have leftover spaghetti or angel hair pasta lying around, I like to take whatever else is sitting in my fridge and turn it into a frittata. So good, so healthy, and so easy. I learned this frittata trick from my mom on one of her visits. You see, when my mom comes to town, she takes over my house…and my kitchen. I love her dearly and I love all that she brings to my household. It makes things easier for me. Anyhow, several years back, she introduced me to the frittata. She looked at the lonely mound of pasta staring at her from the fridge and asked us why we let it sit unused. Shame on us, right? I had never had a frittata before. Never thought it could be applied to pasta. 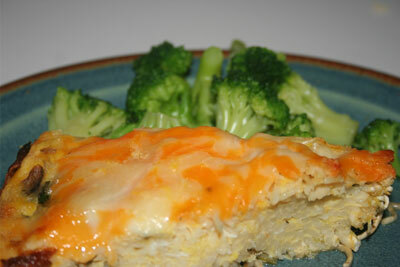 Lo and behold, after she worked her dinner magic – this frittata was damn good! Served with a salad, we were filled up! Awesome! So here it is, a dinner a I turn to once in a while that seems to make everyone happy. The best part of this recipe, is that it is very flexible.Enjoy! In a large ovenproof skillet, heat the olive oil. Saute the onion and garlic. Cook until soft. Add the other veggies. You really can use any veggies with this dish. I just use what I have on hand. Cook a few minutes – maybe 5. Stir in the pasta. Make sure that the pasta is mixed in well with the veggies. Cook for a minute. Add in your beaten eggs, salt, pepper, red pepper flakes, and the basil. Let it set for 30 seconds or so. Add in the cheese. Now transfer the pan to the oven and bake for around 10 minutes or until the eggs are completely set and the cheese is melted to your preference. Serve a slice with a salad or soup and maybe a nice hunk of crusty bread. This dish is perfect for any meal of the day and so easy! Enjoy!